Hello! Latisha Yoast here with a “Clean And Simple” (CAS) card that you could give away for any occasion. Gold is still a hot trend, and really makes this project pop! 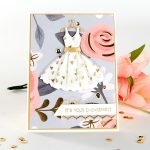 I used the Shining Star die template set from our newest Let’s Party Collection to create this card. First, cut/emboss gold cardstock using all of the pieces of the Shining Star die set, using the Grand Calibur machine. 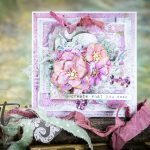 To create the card panel for a top folding A2 (4.25 x 5.5″) card base, cut a piece of grey cardstock to fit the card base, use it to mat a piece of vellum and adhere together. Then adhere to the card base using foam squares. For the banner die cuts, adhere one of the larger star die cuts over a bow. Layer some of the stars using foam adhesive. 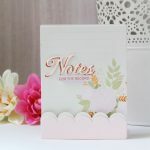 Using foam adhesive, place the banner die cuts to the card. Adhere pattern paper to the bottom of the vellum. Cut/emboss the “shining star” sentiment with black cardstock and place it above the pattern paper to finish.